Reacting to the on-going rumour of TB Joshua’s latest prophecy, the press statement above was released by the church last night and has denied the rumour!!! 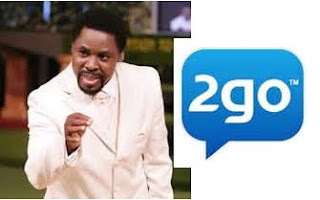 The rumour making waves since yesterday is that TB Joshua has prophesied mass death of 2go mobile chat users this week. The gist claims witches will take over 2glo network and spread demons. As at the time of this report, the viral news was unconfirmed. TB hasn’t said anything in regards to this. 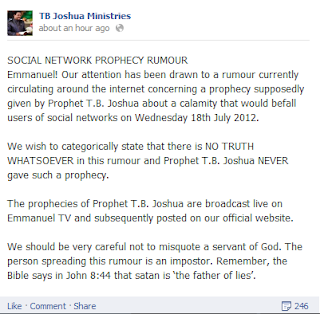 Haba Naija this kind rumour no fair o.
U wan bankrupt the company?